One of the more common and perhaps overused bits of startup wisdom is that you should build something that you personally want, so you can stay passionate in the face of setbacks. Y Combinator’s motto is “Make something people want,” but Tuesday the target audience seemed to be companies. But at Tuesday’s Y Combinator’s Demo Day, the 17th for the cachet-wielding Silicon Valley startup incubator, the latest batch of startup founders presenting to about 650 investors seemed mostly to be aimed at building things that they would have wanted as a business person. That means tools to more easily integrate with established institutions, ways to take care of aggravating headaches, such as printing and shipping, and yet another batch of workplace collaboration apps. 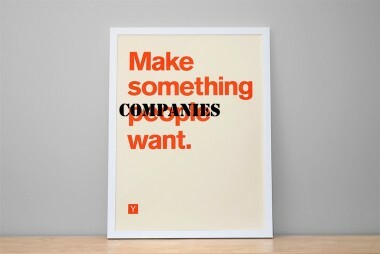 In other words: Make something companies want. There were multiple ways to quickly push and test multiple versions of a product in development, such as Crowdery, A/B testing for physical products; and Apptimize, an A/B testing for mobile. There were niche versions mimicking the Stripe back-end payment system — such as a “Stripe for printing” (Lob) and a “Stripe for shipping” (EasyPost) — as well as an “API for banks” (Standard Treasury) to allow developers to get data from financial institutions. Or services that tell their users when cloud services are down (StatusPage), along with a company that helps collaborators sync changes in documents (Kivo) and an app that replaces email with chat (Hum). “Google. Dropbox. Microsoft. These companies do not get it,” the Kivo presenter declared. Business-to-business is not a new trend at Y Combinator or elsewhere, but it certainly was persistent. Even more enterprise-focused was Asseta, which helps companies sell off big pieces of equipment they no longer need. It was founded by former equipment brokers who claim they’re aimed at a $5 billion market. And more: An offering to help analyze legal bills (SimpleLegal) and another to help deal with employee immigration paperwork (Teleborder). “I think people building software companies don’t realize that everyone in the world is not building software companies,” observed Kent Goldman of First Round Capital about the enterprise focus. But, more than ever, these startups seem to mean business — really, given that many of them already have paying customers and have already launched. And few behaved like a light under a bushel. Two years ago at the same event, I noted that more than a third of the companies said their presentations were off the record. Tuesday, only three of 49 startup asked attendees not to tweet or write about them. Versus previous YC classes, there are also fewer “gnarly coders” represented this summer, one participating founder told me. Instead of young guns waiting for inspiration to hit, this group includes many people who have relevant domain experience from their previous gigs, who recognize a problem and have the experience to perhaps actually address it, he said. But it was not all dull APIs and clouds and enterprise fixes. There were also some oddball products, such as a site to pay strangers to listen to your troubles (7 Cups of Tea); a cheaper hearing aid (SoundFocus); and fraud-blocking credit cards for old people (True Link, which we previously covered here). And the biggest draw of the day was perhaps someone much more obvious: Former San Francisco 49ers quarterback and football legend Joe Montana. It was his first Demo Day as an investor.